Licensed-assisted access (LAA) is a 3GPP enhancement of Long-Term Evolution (LTE) to allow cellular network operators to offload some of their data traffic by accessing the unlicensed 5 GHz frequency band, which has been standardized in LTE Release 13 only for the downlink (DL). LTE LAA allows operators to transmit in the unlicensed spectrum using a secondary cell, alongside a primary cell operating in the licensed band that they own. Using LTE LAA, a mobile operator can offload the LTE network into the unlicensed spectrum, when this is required. The licensed spectrum can be used to ensure the transmission of the crucial LTE control signals without interference. Additionally, applications that require high Quality of Service (QoS) (e.g. video streaming) can exploit the advantages of the interference-free licensed spectrum. There is a considerable amount of unlicensed spectrum available which is used to provide unlicensed access for short range radio transmissions. These bands, called ISM (Industrial, Scientific and Medical) bands are allocated in different parts of the spectrum and are used for a wide variety of applications including WiFi, Bluetooth, microwave ovens and much more. The frequency band of most interest for LTE-LAA is the 5GHz band. Here there are several hundred MHz of spectrum bandwidth available. 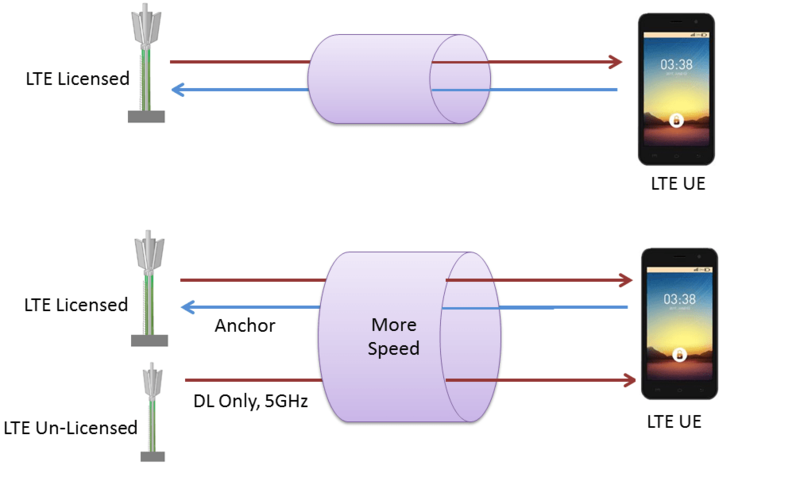 In order to increase the throughput in downlink, Unlicensed 5GHz band is used for LAA in downlink direction. Primary cell remains the LTE licensed legacy one, which make the connection between UE and eNoB. And then LAA is used for better throughput. Given the widespread deployment and usage of other technologies in unlicensed spectrum, it is necessary that LAA coexists with existing and future technologies targeted for unlicensed spectrum. So to make use of this unlicensed spectrum, a method of Clear Channel Assessment, CCA, or Listen Before Talk, LBT is required. This often means that instantaneous access may not always be available when LTE-LAA is being implemented. To ensure co-existence of LAA and WiFi (includes other similar technologies) in the un-licensed band, LAA needs to use a fair and efficient Listen Before Talk (LBT) technique. LBT Is a contention-based protocol that allows many users to use the same radio channel without pre-coordination. There are two broad types of LBT schemes: Frame Based Equipment (FBE) and Load Based Equipment (LBE) are used in the literature. In FBE, channel sensing is performed at fixed time instants; if the channel is busy, LAA BS backs off for a fixed time period and senses the channel again after this period. In LBE approach, the channel sensing is performed at any time instant and random back-off is used if the channel is found busy. Rel-13 defines LAA only for the downlink (DL). One of the main features of 3GPP Rel-14 is the introduction of enhanced-Licensed Assisted Access (eLAA), which includes uplink (UL) operation for LAA. The technology continued to be developed in 3GPP’s release 15 under the title Further Enhanced LAA (feLAA).